Crescent beads are small, two-hole beads in the shape of thin, flat moons. 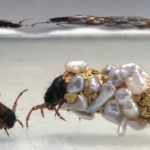 They combine beautifully with other two-hole beads and seed beads to make interesting beaded jewelry. You can use them in bead weaving designs anytime you want to create a subtly architectural effect. 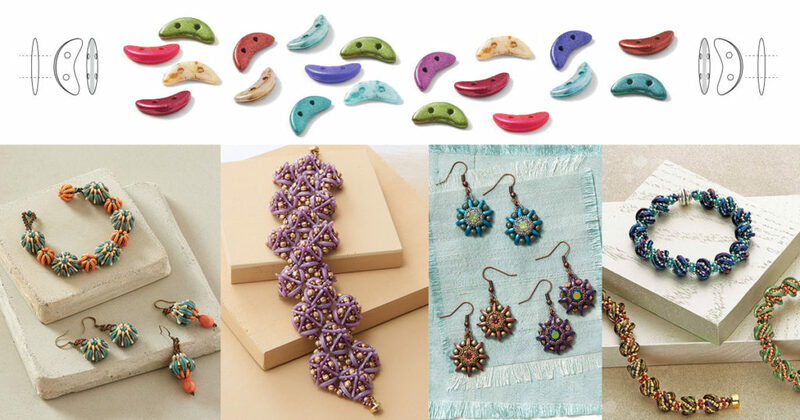 I’ve collected a few patterns to inspire you to try using crescent beads in your beaded jewelry designs. A couple of these patterns take their inspiration from unusual plants: sea anemone and agave. I think the thin, curved surface of the crescent beads resembles the spiny structure of those plants. It also reminds me of air plants (affiliate link), which make a perfect, peaceful addition to your beading space. This Ocean Flowers Bracelet by Agnieszka Watts is just so sweet! Use crescent beads to weave a stream of ocean and floral components in a tubular peyote stitch variation and circular peyote stitch. 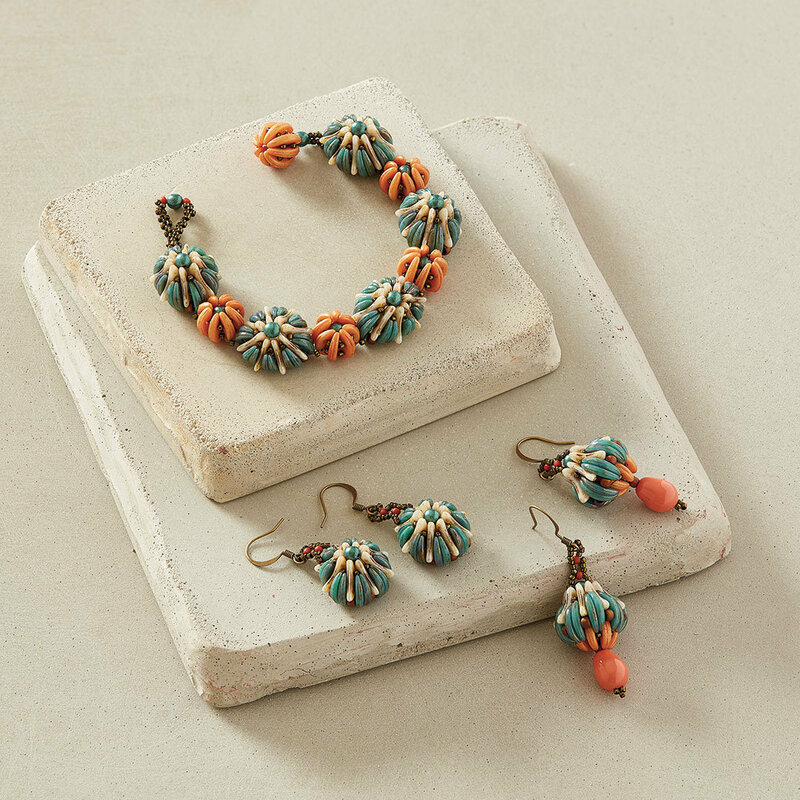 The linked components and unique beaded clasp resemble sea anemones, which are close relatives of coral and jellyfish. The crescent beads create the perfect mixture of structure and texture on this easy-to-stitch bracelet. Weave this cheerful bracelet in cubic-right-angle-weave units and sections of spherical tubular herringbone stitch. The Whirligig Bracelet designed by Kassie Shaw uses crescent beads with seed beads and fire-polished rounds. The swirly effect can look so different depending on your color choice! Try something summery or holiday-inspired with this intermediate bracelet pattern. Use tubular netting to form a bezel around a crystal chaton for an earring that’s inspired by the agave plant. 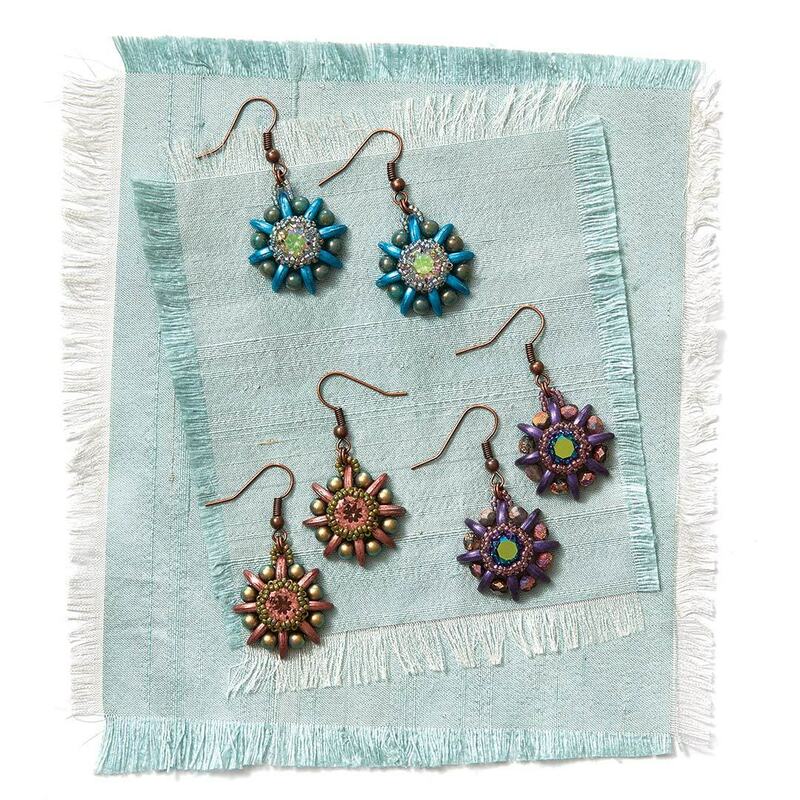 These Agave Rose Earrings designed by Jenny Argyle are easy to make and fun to wear. I love the way you can take just a very few materials and turn them into something so special. 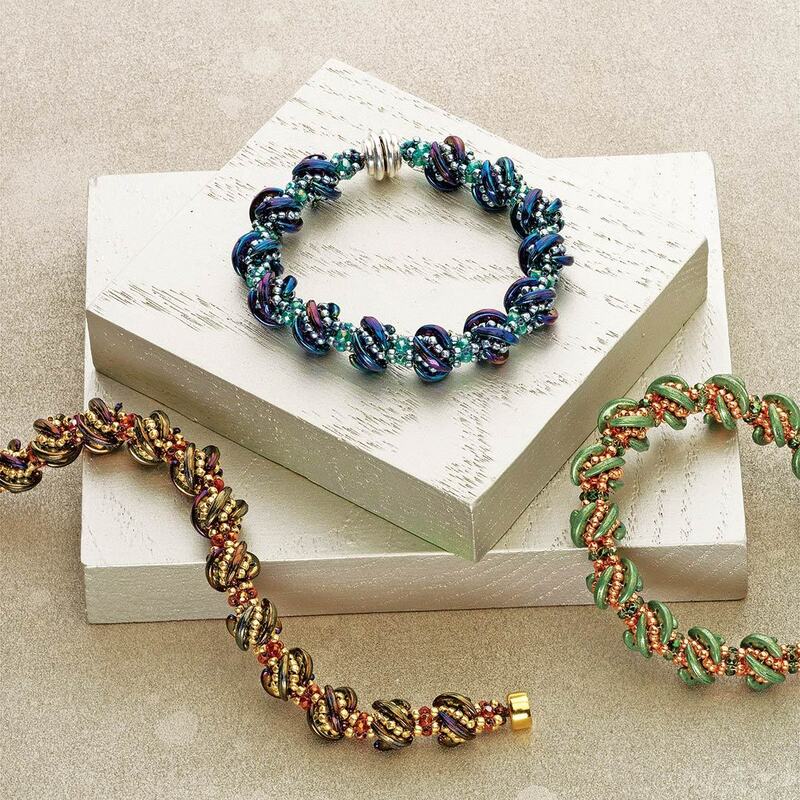 Two-hole melon beads and crescent beads come together in this textural bracelet of joined components made using a variation of circular peyote stitch. The Crescendo Bracelet by Nichole Starman is an impressive, eye-catching bracelet that’s sure to garner compliments. Make it in the luscious lilac color palette shown here, or experiment with your favorite two-tone combination such as turquoise and red or black and silver. For a fun read, check out How Crafters Can Survive on a Deserted Island. Spoiler alert: If I ever find myself lost at sea, I’m really hoping to bring along my giant suitcase.